At once, some lonely traveller..
(courtesy Mark Robinson; and NASA . NASA has currently undertaken two missions to Mercury. - Mariner 10, launched in 1973 completed three flybys of Mercury in 1974/75. - Messenger, launched in August 2004, undertaking three flybys of Mercury in 2008/09 and finally settling into orbit in March 2011. In 2013 the European Space Agency (ESA) and Japan Aerospace Exploration Agency (JAXA) are launching the BepiColombo mission, a space module incorporating two probes due to go into separate orbit around Mercury in 2019. Topics covered on this page are shown below. The closest planet to the Sun, circling it every ~88 days. It is only one third of the Earth's distance from the Sun. Mercury rotates slowly about its own axis, once every 59 days. As a result of this slow rotation, while at the same time moving relatively quickly around the sun, it actually takes two Mercury years (~ 176 Earth days) to go through one day and night period. Its orbit is more elliptical than any other planet, and its shape is closer to a perfect sphere than the Earth's. As it is so close to the sun we can only view it from Earth either just after the sun sets or just before it rises. Therefore the view tends to be obscured by atmospheric disturbances. This closeness means that the Hubble space telescope cannot be pointed at Mercury, since any errors in alignment could result in the full force of the sun's rays destroying its sensitive camera. Mercury, like Venus, has no moon - this is because they orbit too close to the sun to provide a long-term stable orbit for a moon. Any captured body orbiting close to the planets would eventually be destroyed by gravitational forces, and for an orbit too far out the sun's gravity would pull it away. It has a weak magnetic field which is suprising since this is associated with a molten core and its small size would have implied that it should have cooled down by now. It is the only other planet to have a magnetic field, which has two poles and tilts almost in the same direction as its rotational axis. The presence of this magnetic field implies is has at least a partly molten core. Mariner 10 observed a shock wave called a "bow shock" in front of the planet, where the planet's magnetic field meets the solar wind. It also has a high density which indicates that it is composed of aprox. 60-70% metal. Mercury's size is between that of our Moon and Mars, with a mass of about 5%, and gravity about one-third, that of Earth. It has no significant atmosphere, is heavily cratered and has the highest temperature range of all the planets from 467ºC down to -183ºC. (It does in fact have a very thin atmosphere consisting of atoms blasted off its surface by the solar wind - however, this quickly disperses into space). As it has no significant atmosphere, if you were standing on the surface with the sun shining down, the sky around would be black. 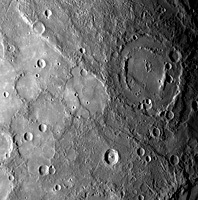 Also, despite the high temperature during its day, some deep craters around the poles appear to show evidence of frozen water. Eruptions of lava in the distant past have left the flatter smooth plains, although some may have been caused by local impact ejecta. The surface of Mercury also has enormous fault cliffs rising up to a couple of kilometers in height. Only one spacecraft has so far explored Mercury - this was Mariner 10 launched back in 1973 and it carried out 3 fly-bys in 1974/75 but was only able to take pictures of one side of the planet (more details on this via pictures below). Overcoming many technical difficulties, the other side has recently (March'07) been imaged from Earth but the atmospheric disturbance limits the quality. A second mission to Mercury was approved by NASA in 1999. MESSENGER stands for MEcury Surface, Space ENvironment, GEochemistry and Ranging mission. The information to be obtained should help explain how the planet was formed, how it evolved and how it interacts with the Sun. The MESSENGER spacecraft was launched in August 2004 with the object of going into orbit around Mercury on March 18th 2011. To conserve fuel, the same approach will be used as for Mariner 10 (although more complex) of using gravity assist via Venus and two fly-bys of Mercury in 2008 and 2009 prior to braking into final orbit for a year of data collection before mission termination. 1. Why is Mercury so dense? 3. What is the structure of its core? 4. What is the nature of its magnetic field? 5. What are the unusual materials at its poles? 6. What gases are found there? Overall, this information will also help us understand how our own planet was formed. By November 2007, MESSENGER had travelled half the total distance on its circuitous path to final orbit around Mercury, having undertaken two fly-bys of Venus in Oct'06 and Jun'07, using the opportunity to test out its cameras and gain a large number of images. At this site you can keep in touch and up to date with MESSENGER'S long journey. 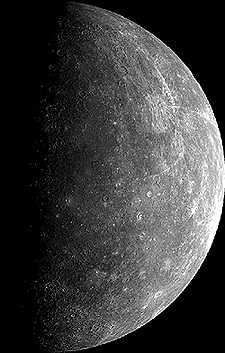 "On January 14, 2008, more than three decades after the third Mariner 10 flyby, the last spacecraft visit of Mercury, MESSENGER passed 200 kilometers above Mercury's surface. Extensive scientific observations were executed during this flyby encounter, including imaging a large portion of Mercury's surface that has never before been seen by a spacecraft. " NASA released the first of the new data on 30th January 2008, two of which are shown below. This flyby will be followed by another in October 2008 and a further one in September 2009 before final orbital insertion on March 2011. 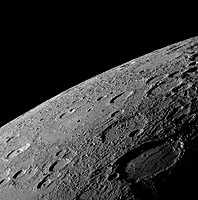 MESSENGER will be the first spacecraft ever to closely orbit Mercury. Visit this link for the latest update of Messenger images and other information. The Spacecraft is built out of very light composite materials to reduce weight, since over 50% of the total weight of around one ton is due to fuel for the manoeuvering into correct trajectory and into the final orbit. Its size is approx. a 4 ft cube and the instruments have been miniaturised to save weight. The probe is protected from the intense heat by a sun shade made from ceramic cloth stretched over a titanium frame. The highly elliptical orbit will provide about an hour in close up view of Mercury, at a distance of less than 200 miles at times, and then a long period of 11 hours for cooldown as the probe swings well away before the next close encounter. The European Space Agency's (ESA) original ambitious plans to launch a probe in 2008 involving the first ever landing on Mercury's surface have been dropped due to cost. The mission is now, in collaboration with JAXA (Japan Aerospace Exploration Agency), to launch two probes in August 2013 due to arrive at the planet in 2019. The mission is given the name BepiColombo in honour of the Italian scientist Guiseppe(Bepi) Colombo (1920-1984), a scientist who studied Mercury's orbital motion in detail and who proposed the trajectory of the Mariner 10 flybys. During the voyage to Mercury the two probes will be transported by a transfer module. This will consist of an electric propulsion unit for interplanetary cruise (ion propulsion - the engine being based on that tested on the ESA SMART-1 lunar orbiter), and a chemical propulsion unit for trajectory alterations and insertion into final orbit. The whole will form one single composite spacecraft - see picture on right (courtesy ESA) and their mission site. The Mercury Planetary Orbiter (MPO) developed by ESA will be inserted into a fairly close and relatively circular orbit around Mercury and will carry cameras, and a wide range of scientific instrumentation (.. spectrometers(IR,UV,X-ray, Gamma-ray, neutron), a radiomenter, laser altimeter, magnetometer, particle analyser, Ka-band transponder and accelerometer). The MPO will rotate as it orbits to ensure that the instruments are kept continually looking down at the surface of Mercury. The Mercury Magnetosphere Orbiter (MMO) developed by JAXA will have a more elliptical orbit and will study the magnetic field, magnetosphere, and interplanetary solar wind using a wide range of instrumentation (magnetometer, ion spectrometer, electron energy analyser, cold and energetic plasma detectors, plasma wave analyser and imager). 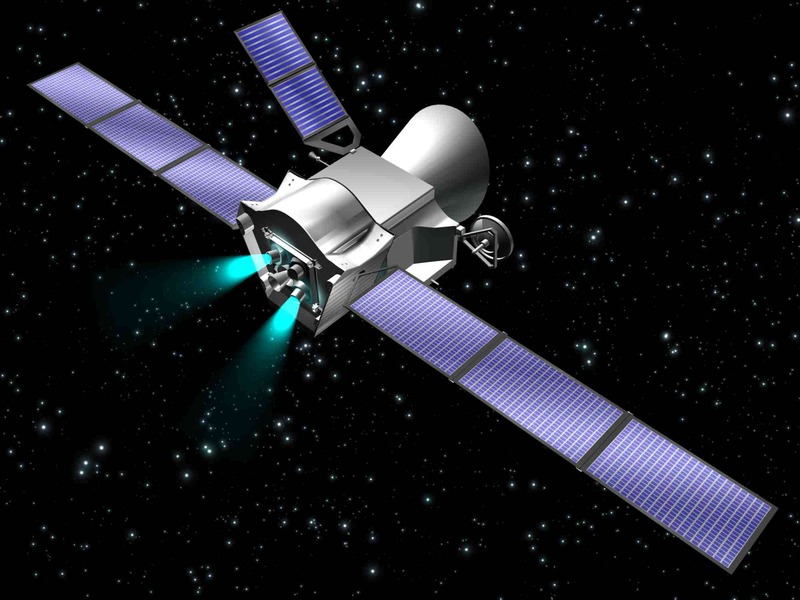 BepiColombo is designed to build upon the findings of MESSENGER, the main differences being wider range of data being gathered by Bepi Colombo and the deployment of two complementary specialised orbiters with the MPO in a relatively circular and closer orbit (to aid picture quality) and employing a faster data gathering rate. Once in orbit around Mercury the programme of investigation is due to last for one year, with a possible extension to two years.